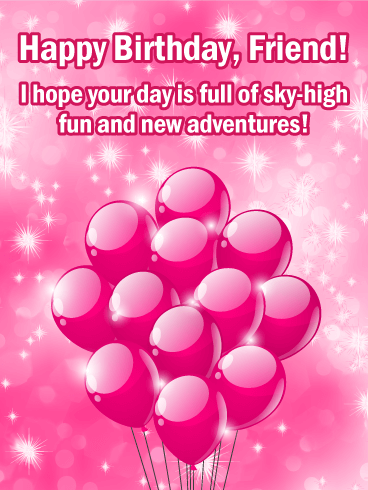 Help your friend relive the cotton-candy days of youth with this pink birthday card! 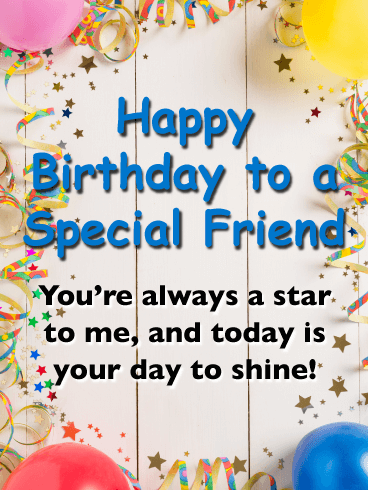 Your friendship has been filled with glittering days, helium-light memories that rise to the top of your mind regularly because they are some of the best moments of your life. 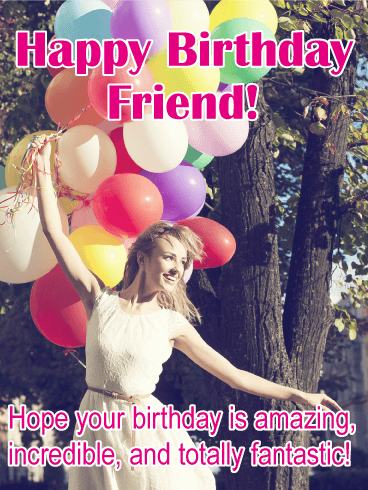 Help your friend recapture that feeling and create a new lighter-than-air memory by giving them this birthday card! Colorful Birthday balloons can only mean one thing, that it's going to be a super fun day! 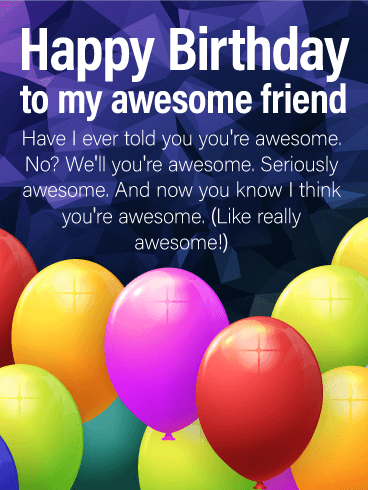 This Happy Birthday card will remind your friend that birthdays are made for fun! 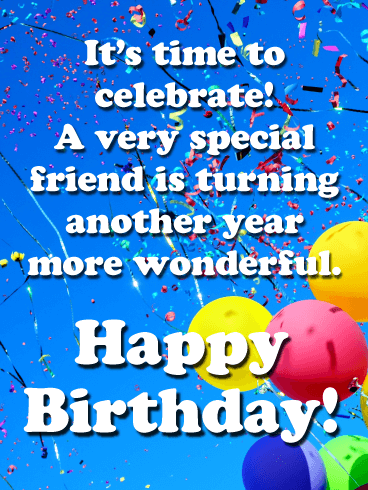 This birthday card features fun colors of yellow, red, blue, and green, giving it a wonderful festive look. 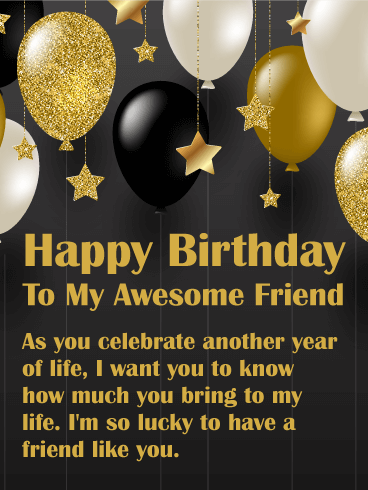 Let your friend know you are thinking of them by sending this birthday card their way. It will get the celebration started! A birthday is a good time to realize that the sky is the limit for what we can accomplish for the year ahead! 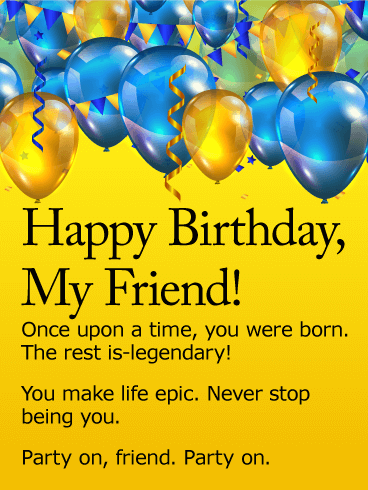 So remind your friend of this as they celebrate their birthday by sending a positive Happy Birthday card their way. It sports a joyful child being lifted up by colorful vibrant balloons. 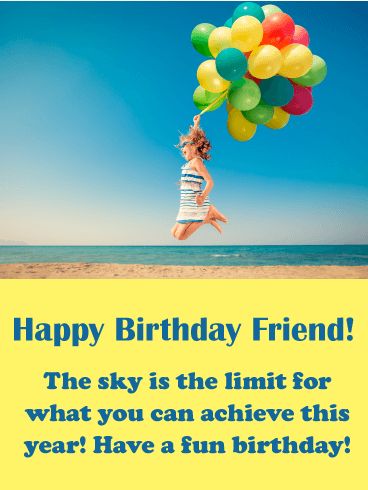 It's a very uplifting and inspiring image, perfect for your friend's birthday! 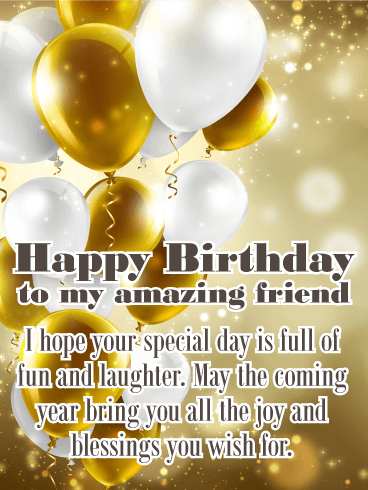 Set on a beautiful gold background, this birthday card is filled with gold and white balloons, golden glitter, and birthday wishes for a special day full of laughter and fun. 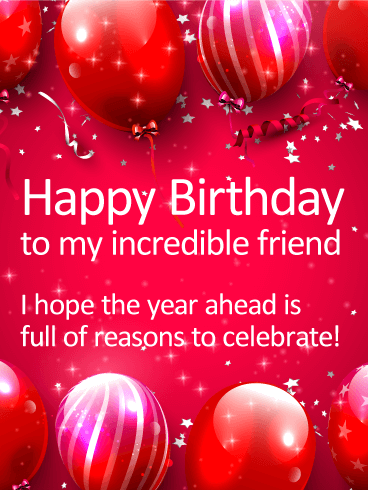 Wish your friend blessings for the coming year with this classic birthday card. 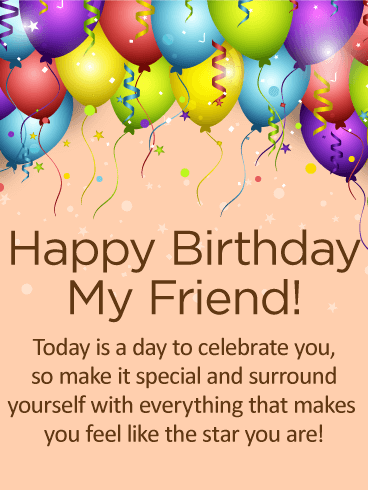 A birthday is a perfect occasion to tell someone how much they mean to you. This birthday card does just that. 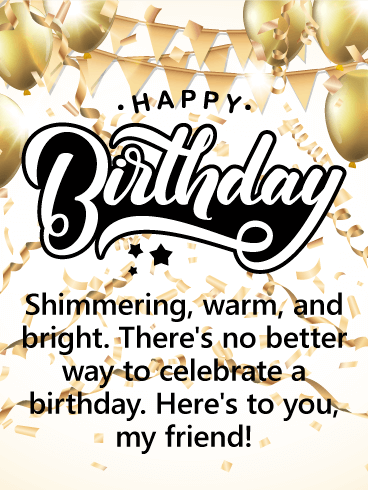 Tell your friend how much joy she brings to your life when you send her this birthday card full of black, white and glittering golden balloons. They are highlighted by gold stars on a stunning black background. Time to celebrate! 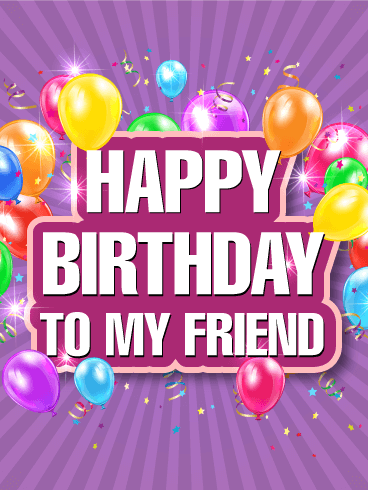 Send all the best birthday wishes to your friend in just one birthday card! Amazing, incredible, totally fantastic-yep, that about sums it up! 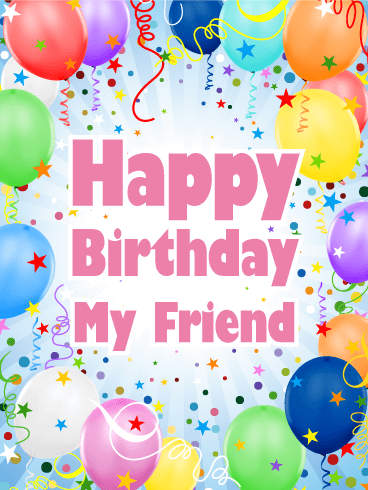 Wish your friend a happy birthday that is way better than good, it's great. 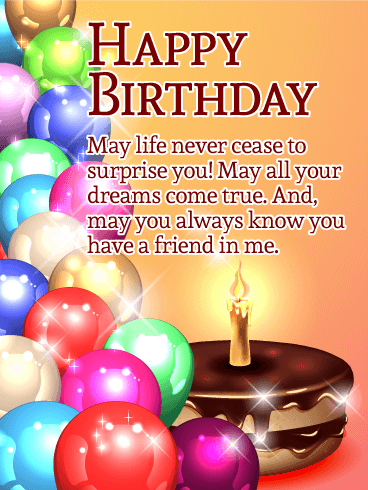 This birthday greeting card is so colorful and so bright one can't help but have an amazing　day after receiving it! From the moment you met your best friend, the two of you have been as thick as thieves. You share each other's struggles and celebrate each other's joys, offering support through every part of life. 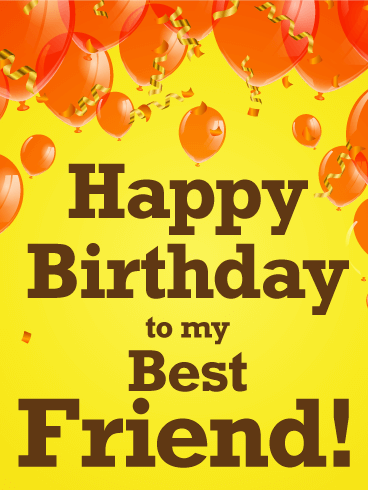 On their special day this year, send this Happy Birthday card to celebrate everything you love about your best friend. 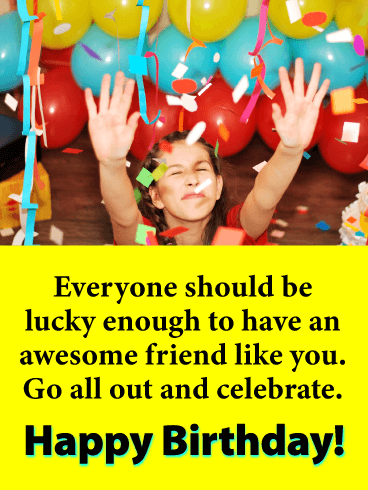 Make this an incredible birthday by making the most of your closest friend today! 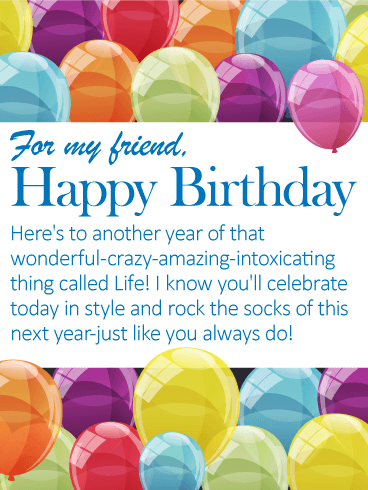 For a special friend who's turning another year older, this birthday card is guaranteed to put them into party mode! A festive background of balloons, streamers and confetti is cause for celebration, surrounding your best wishes for a "Happy Birthday!" 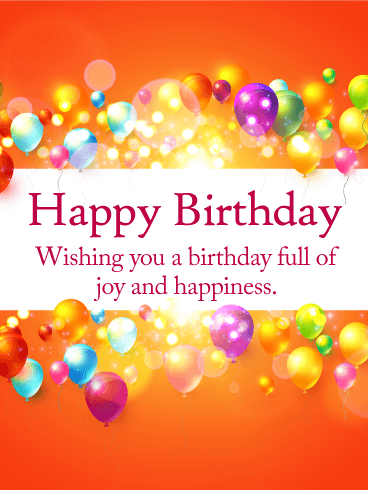 Perfect for any age or gender, this joyful birthday card will have them feeling loved and remembered on such an important day. A background of festive, colorful balloons floating through the air sets the tone for an endless party on your special friend's birthday! 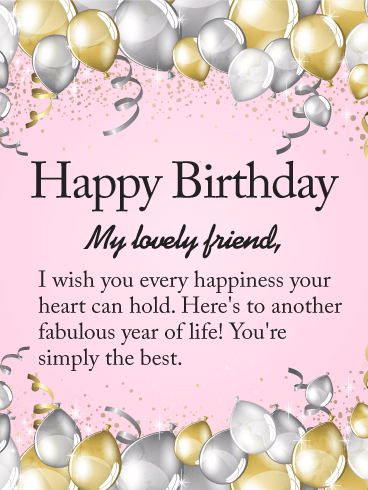 The thoughtful words in the center of the birthday card bring your best wishes for them to have "the biggest and best celebration of all!" 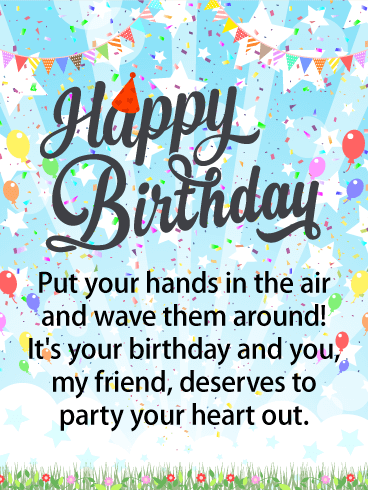 Guy or girl, young or old, this greeting is a wonderful choice for any important person in your life as they turn another year older. What is a birthday without balloons? 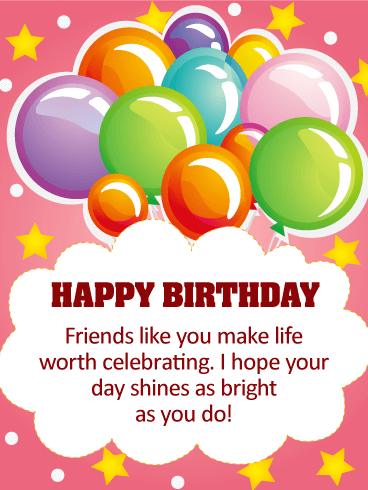 Send some sparkling balloons and a heartfelt birthday wish with this exciting card to a friend who needs it the most. 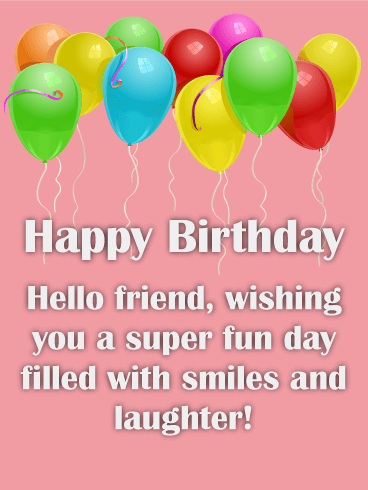 Do not waste time on putting a smile on their face and send them this birthday card today! Show them how much they mean to you! 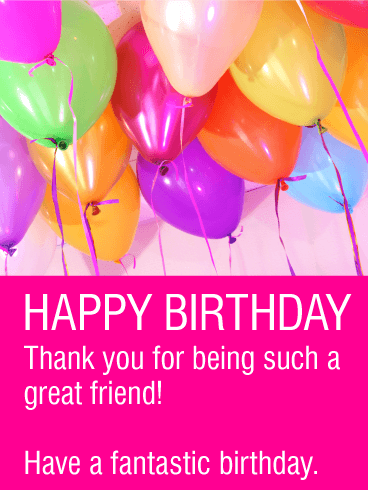 Let your friend know how much you appreciate them while celebrating their birthday with a bright and fun birthday card! 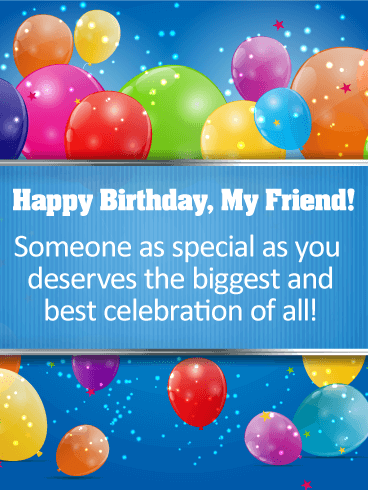 Everyone deserves to know how much they mean to someone, especially on their birthday. Get ready to warm your friend's heart and send them this card today! 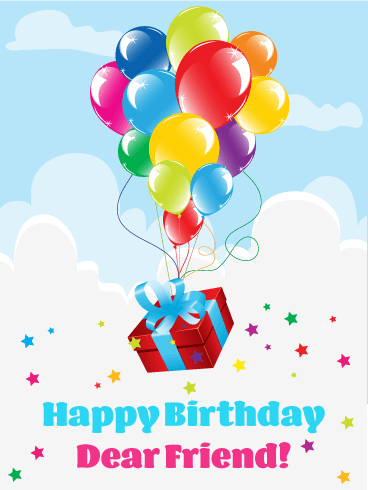 These birthday balloons sparkle and shine in festive colors! 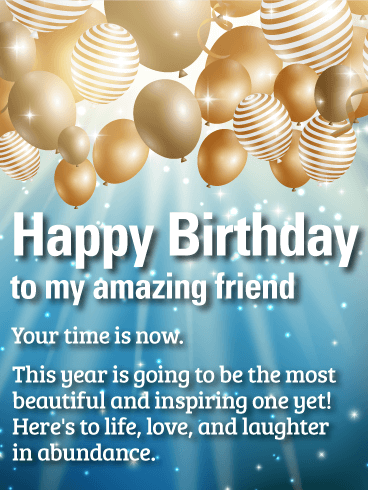 Send a fun and meaningful birthday card to a fantastic friend. 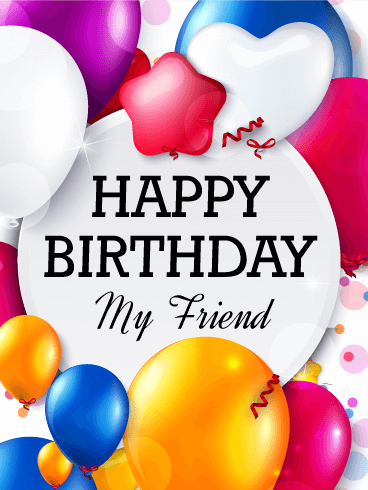 A birthday is the perfect opportunity to share wishes for a great day. What are you waiting for? 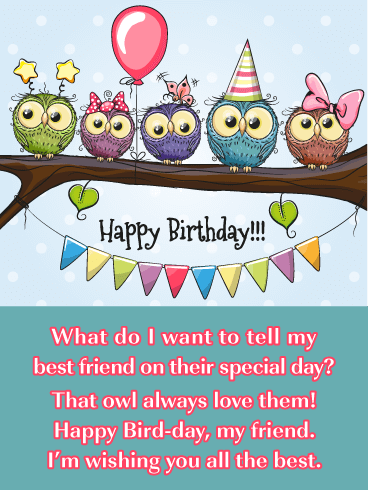 Send this colorful Happy Birthday card and make it a brighter day for your friends!